It’s a challenge for a business to achieve the performance and reach the goals you set for yourself in such a competitive PPC space. Who doesn’t want to increase ad performance and see the most value possible for the money spent on paid search? There are so many different strategies your business can use to get the biggest bang for your buck: Analyzing reports, refining ad copy, testing target audiences … the list goes on. One of the most crucial (and controversial) strategies, though, is bidding on your own brand terms. Read on for real, tangible ways you can make bidding on brand terms matter. Bidding on these terms ensures you’re covering your core brand terms in all searches and protecting your brand against competitors trying to capitalize on your brand trademarks. Run search query analyses periodically to make sure you’re still reaching the right audiences! Use these analyses to discover additional relevant terms to add to your campaigns, or to find irrelevant terms to add as negative keywords. Example: Some people search for a brand name and don’t necessarily include “log in” in their search, but still click on the login link. In order to better manage this, set up event tracking on your site and bucket people who have logged in multiple times into an audience, then negate that audience from your brand campaigns. 1. Control the exact messaging a user sees when they search for you. Customers are looking for you and expect you to provide a branded experience, even if it’s not directly on your website. 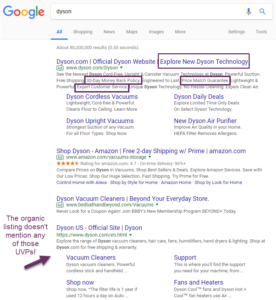 Relying only on organic results means the message a person sees could be whichever organic description they hone in on, not necessarily what you want them to see. It may also take months for organic changes to be made. With a paid ad, you can ensure someone gets the right message at the right time based on their search. With PPC, you can push special features or unique value propositions in ad copy and extensions with high-performing content, all of which you might not be able to share in your general homepage meta descriptions (new products, updated services, sales and promotions, etc.) In addition, you have the ability to test what messaging works best for your brand. This can even help inform your content strategy. 2. Build better content and marketing strategies. Paid search provides a high level of agility that other channels don’t. Avoid thousands of dollars in wasted spend on t-shirts with a slogan that your audience doesn’t care about. De-risk your strategy by testing messaging and content to see what actually resonates with your audience before investing time and resources into your site, merchandise, events, or other marketing channels. 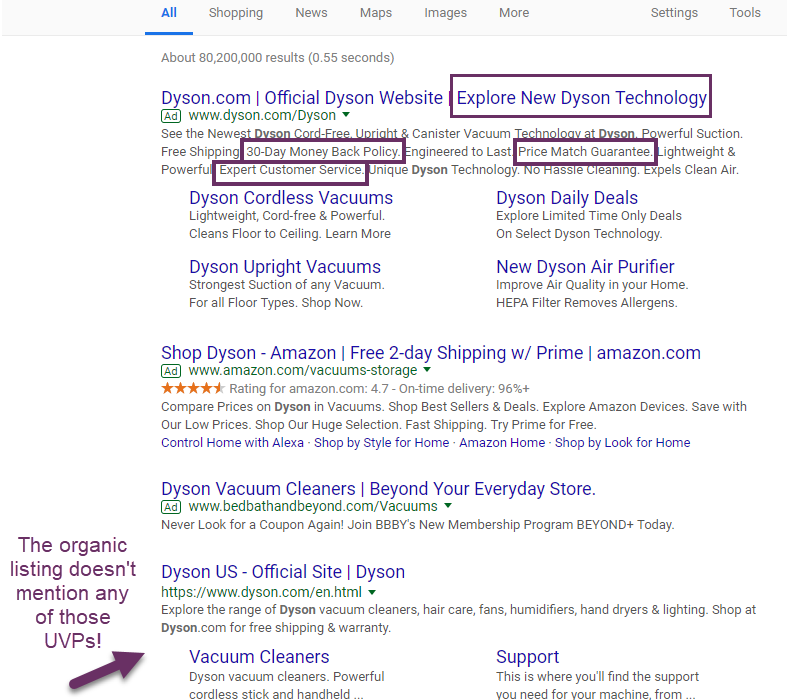 Just because you’re the #1 organic result doesn’t mean you’re also #2-10. It also doesn’t mean that you’re prominent in other features on the SERP like maps, images, shopping, knowledge graphs, answer boxes, or anything Google will roll out next. To combat this, you can secure more space above these other results by bidding on your brand terms. The more coverage, the better! Especially on mobile, where the top spot (paid or organic) takes up the majority of the screen. 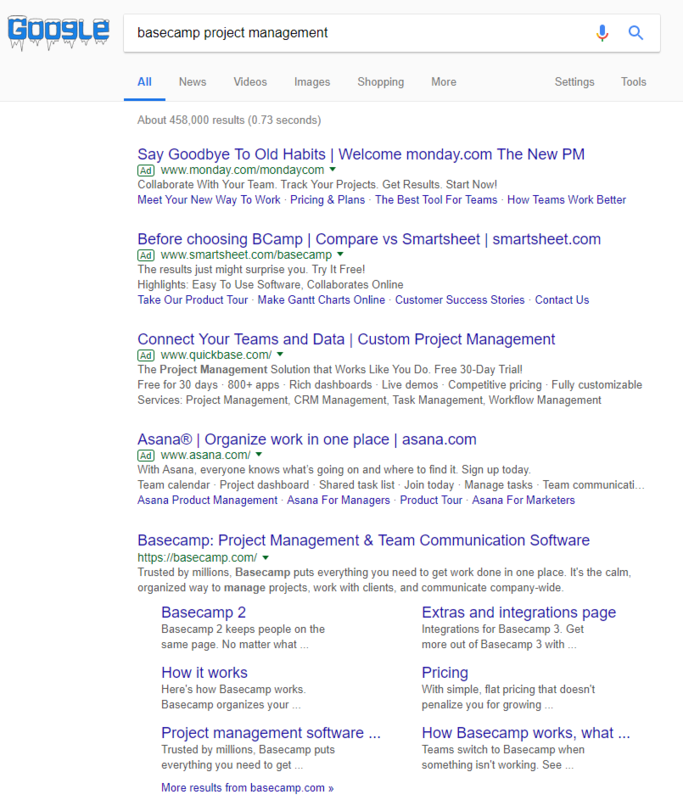 Search for “basecamp project management” on desktop: Monday, Smartsheet, Quickbase, and Asana show before Basecamp, even though they’re #1 organically. 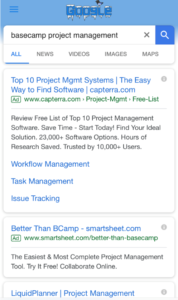 Search for “basecamp project management” on mobile: Capterra, Smartsheet, and LiquidPlanner paid results show up before Basecamp, even though they’re #1 organically. Search for “lush dirty hair cream” on desktop, same search on mobile: Amazon shows up above organic results and is the second organic result. Lush doesn’t even sell on Amazon as of this post, and eBay is the number two shopping result. This may be pushing potential customers to purchase products from third party sellers that they don’t have control over (the products might even be used or fake). That may leave customers turned off to your brand. 4. If you don’t do it, your competitors will. 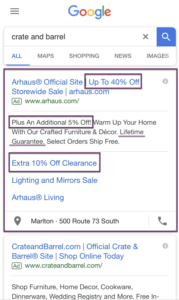 Although high-intent users are looking for your brand, this doesn’t mean a competitor can’t sway them away from your organic result with a great offer. On mobile, having a competitor in the top paid spot of your brand search means a user doesn’t see your results until scrolling. Bidding on your brand terms is an important investment as a means of preventing competitors from poaching your users who are close enough to conversion that they’re actually looking for you by name! Whether you have stellar SEO or not, you’re likely to miss out on a large chunk of revenue. Although your competitors may not be there today, that’s no promise that they won’t be tomorrow. If you’re looking for a great way to track competitor investment and the impact on your performance, try this Auction Insights Google Sheets script from Brainlabs. If one competitor poaches one lead per year from you on your brand terms, what would the impact be on business? If this is a major hit to your bottom line, consider bidding on your brand. Think about this relative to cost with questions such as: How many leads do I typically get per conversion? And what’s my average revenue for a project? You’re willing to pay $X for a recruiter … Are you also willing to pay for something online to work for you all the time? 5. Get incremental leads and traffic when you show for paid and organic. Although organic clicks are free, in reality, solely ranking well organically for branded terms does not mean that you will get all of the traffic for those queries. Why? Organic results can show below the fold even on desktop. Strategically bidding on branded terms can provide an incremental lift, bringing in highly-qualified traffic. One of our clients tested pausing brand campaigns in Q4 of 2017. There were an additional 74 clicks from paid search during the previous 28 days that were not recouped by organic search. Organic CTR did increase by 6%, however it was not enough to make up for the lost paid traffic. Another client, a Fortune 500 company, performed a similar test of pausing brand keywords. They are a name that anyone would recognize, making them an immediate candidate for “why are you bidding on brand?” They did see up to 80% of their traffic recuperated by their organic listing, but the lifetime value revenue coming from that incremental 20% of traffic was well worth the investment. They have since reached their goal of increasing their brand impression share as much as possible. 6. Those less expensive clicks are worth the investment. Brand terms are typically cheaper than non-brand terms, ROI is strong, and as represented in our last point, organic can’t recuperate 100% of paid clicks. Lost paid branded traffic can equate to a loss in bottom line. Just because you’re bidding on your brand terms doesn’t mean you have to spend a lot of money. Brand terms are likely to have a high quality score and high CTR, which helps decrease average CPC or increase your average position at a lower cost than with a low quality score. You can also run bid-down tests to find out how little you are able to pay for branded clicks while still getting the results you’re looking for. We actually increased conversion volume for one of our clients after lowering brand bids. Lastly, when competitors bid on your terms, they generally have lower quality score and thus have to bid higher, potentially resulting in lower competition for you if you’re there to set the baseline bid. Bidding on brand terms can be a controversial topic, but the benefits outweigh the negatives. By bidding on brand terms, you’re able to control the messaging people see about your brand, de-risk your marketing strategies, and control the SERP. Because, hey, even if you don’t bid on your own brand terms, your competitors will. Stay ahead of the curve with this simple investment in your brand.